Cul-de-Sacked. 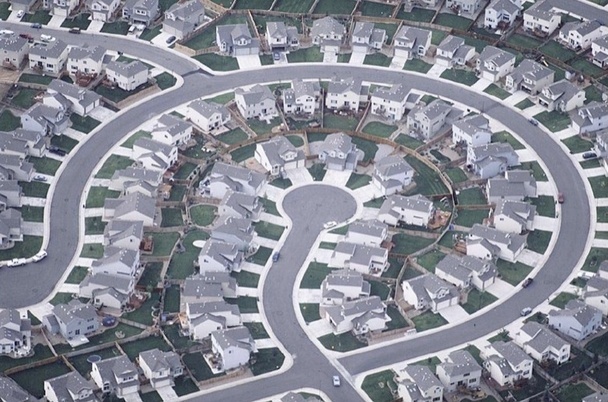 Emily Badger of The Atlantic‘s newly launched Atlantic Cities argued that the cul-de-sacs—the suburban answer to the overcrowded urban grids—may be a dead-end in more ways that one. Badger said cul-de-sacs are responsible for our decreased sense of safety, and moreover, happiness. Talking Transit. Gothamist is right on calling out New York’s MTA as being “really into technology this month.” In a win for the constantly connected and a potential loss for our already-hectic commutes, starting Tuesday, AT&T and T-Mobile subscribers can pull out their cell phones and talk away on underground cell service through the 14th Street corridor. It will take the MTA five years to fully cover the entire New York subway system. Five more years of relative peace-and-quiet. Paramount Makeover. The LA Times reported that Paramount Pictures is planning a whopping $700-million upgrade to its Hollywood lot, creating nearly 7,300 jobs during construction over next two decades. Rios Clemente Hale Studios and Levin & Associates Architects are charged with improving a place that hasn’t seen much change since the Gary Cooper days without compromising its old Hollywood charm. Park(ing) police. A Miami-based PARK(ing) Day organizer created a green oasis for the day-long celebration of public space, putting up planters and bringing seats, tables, and WiFi, but according to police, he lingered a little too long. Police arrested the man for taking too long to clean up his parklet the next day, reported Streetsblog.